Dragon Lord Ibbalan the Illustrious—eldest and greediest of wind dragons, the gold-cloaked khan of Mezar—ascends to Irkaly Palace’s highest minaret. The dragon seethes as he sets his gaze westward upon the bright blue waters of the Middle Sea. Out there, resting on the ocean floor, is a treasure. Compared with the great wealth adorning his own form, it is probably a trifle. That is not the point. By right of conquest, it should be his. In the days of the founding of the Dragon Empire, Ibbalan captured the trading hub of Hammra. Before its destruction, all the commerce of Mezar passed through Hammra, a city carved from a gorge accessible through twisting, narrow caverns. The city was located in the highlands north of Prezhan, adjacent to and about halfway along the trade road to Efisis. Hammra’s merchants had become as rich as princes on this trade. They were a people of nomadic stock—themselves only a few generations removed from the stone carvers and dowsers who migrated from the Sarklan Desert. At least a portion of their wealth should have been in the vault, their temple treasury. In Kalpostan, the dragons caught whispers on the wind that Hammra’s merchant princes had a daring plan to hide their riches, praying for a day when dragon rule ended. Ibbalan’s forces moved to intercede. But they arrived too late. The merchants had spirited it away. Bound for the executioner, they boasted of their deed. A dozen or so ships left the great harbor at Prezhan, each with a bundle to be thrown overboard at a spot the captains marked on their charts. But only one ship carried the true treasure. Enraged and thinking it a preposterous lie, the dragon compelled each merchant to speak true, employing magic and torture. 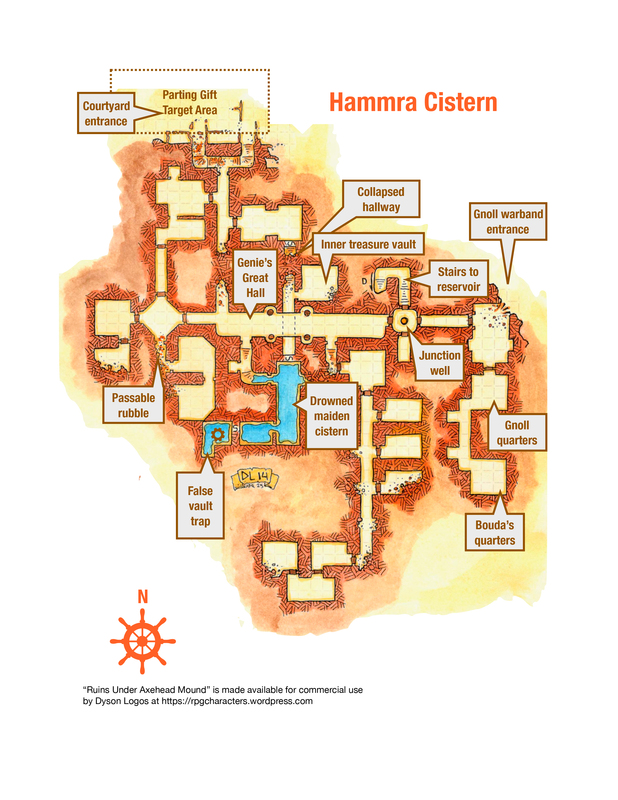 “You will never find the sunken treasure of Hammra” was the dying taunt of each. Over the years, Ibbalan found ten of the captains and interrogated them. Under duress, each led him to their spot. Ibbalan dived, but he recovered naught but worthless bundles of ballast. The decades passed. So did centuries. From his perch in Irkaly, the dragon stews, too proud to admit mere humans outsmarted him, that in fact the first whispers were themselves a deception started only after the treasure was secure. Ibbalan ignores the rumors, folklore, diaries, and searfarers’ logbooks that have emerged in the intervening time. To Ibbalan, these recent artifacts containing hints and tantalizing clues are feints and falsehoods, mere inventions of the imagination, hardly worth his time to investigate. He was thoroughly convinced by the merchants’ dying confessions and the singular phrase they used: “the sunken treasure.” So his gaze stays fixed on western waters. None of these fabled sources, most coming from the descendants of Hammra’s merchant princes, has the whole story. But pieced together, theirs is a collective telling with one inescapable conclusion: the treasure never was on any ship. Sunken, yes, but not beneath waves. The treasure lies in the cleverly engineered cistern that Hammra’s founders built beneath their city, “sunken” in waters drawn from the rock itself. The treasure vault: The horde is mostly bars and coins of silver—the specie of commerce—valued at 200,000 sp. It also has 30 gems (worth 1,000 gp each), a dozen works of art (worth 1,000 gp each) and a censure of controlling air elementals. The merchants collapsed the main entrance to the vault, ensuring that the cistern was the only means of access. 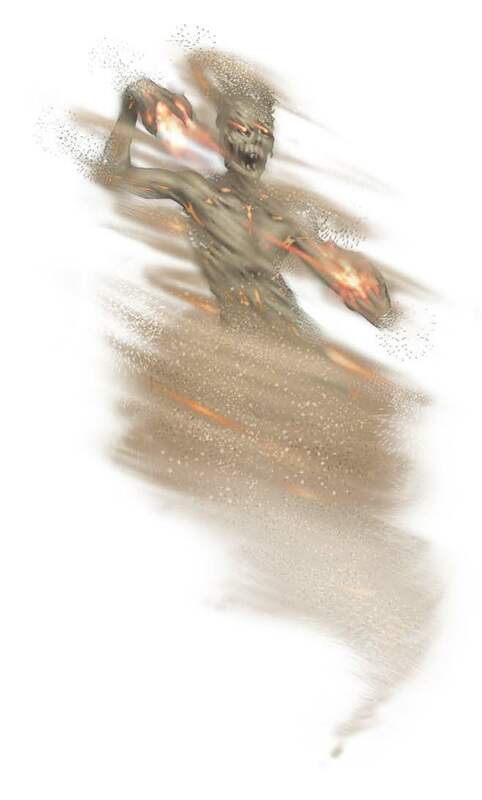 The vault’s guardian is a hoard golem (see Tome of Beasts) comprised of 50,000 of the vault’s silver coins. Any who lingers in the courtyard outside the main entrance is tormented by the edimmu (see Tome of Beasts), an undead wind. In this case, the edimmu is the restless soul of a merchant prince, executed for trying to betray the city by revealing the plan to the dragon lords. The merchant was shamed when his treachery was discovered. Ruya, an al-aeshma genie (see Tome of Beasts) was condemned by the Lords of the Air for refusing a cleverly worded order from her master, one of the merchant princes. This merchant’s gambit included a bargain with the Lords of the Air, convincing them that Ruya’s punishment should involve being bound to the complex for a thousand years and compelled to be its guardian. Ruya roams throughout the complex, though she never enters the cistern proper. She prefers to confront intruders in the Great Hall, whose high ceiling and long expanse gives her room to maneuver. She ignores the complex’s squatters; her only concern is stopping those who are after the treasure. Najwah, a drowned maiden (see Tome of Beasts), occupies the cistern. She was once a member of Ibbalan’s household in Irkaly, put out after her profession of love to a vizier was rejected. Sorrowful and heartbroken, she joined a caravan headed to the Southlands. During a layover in Hammra, she met with the merchant princes as they formulated their plan. To exact her revenge, she was willing to be turned into a drowned maiden and guard the underwater secret door. To those she presumes are the sons and daughters of the city, she will point out the secret door to the inner chamber. Agents of Ibbalan, however, are directed into the false treasure room, which will lock and fill with water to drown them. Parting gift: When the secret door to the vault is released, the water drains the from the cistern and flows into a reservoir below that activates another mechanism. This device controls the delayed release of six volleys of 10 ballista javelins from the courtyard’s surrounding walls. They target the center of the courtyard, timed to release about two hours after it is triggered. The merchants’ hoped that should the dragon lord’s agents reach the treasury, Ibbalan might by then be waiting for his treasure hunters in the outer courtyard. 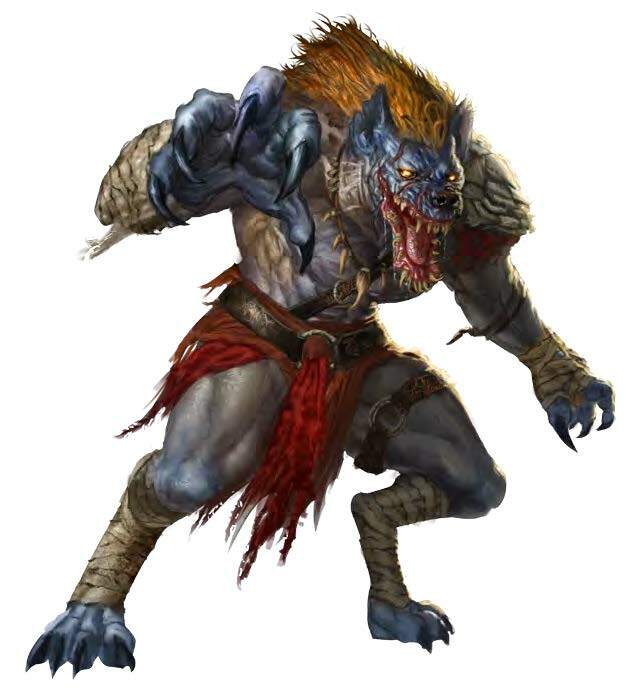 Samar is a bouda (see Tome of Beasts) warband captain leading nine gnoll raiders. They occupy the three western chambers near a break in the outer wall, a secret way into the cistern complex. Their interest in the cistern is only as a hideout and as a source of water obtained from a nearby junction well. The ravenous band has no need of treasure, they are child-snatchers that terrorize local villages. Roaming monsters: a swarm of manabane scarabs, a gray thirster, a millitaur, a j’ba fofi spider, and a temple dog (see Tome of Beasts) are found throughout the complex. 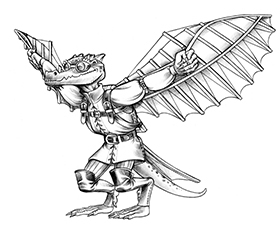 Troy E. Taylor writes about dungeon mastering for GnomeStew and his blog The Dungeon Delver. He lives in central Illinois with his wife, a motorcycle-riding librarian, and their three children.